Make a Garment a Month Challenge: October and late! Due to my Mother's passing I have been out of the sewing room. Instead I've been lying on the couch- eating, watching TV, crying and sleeping. 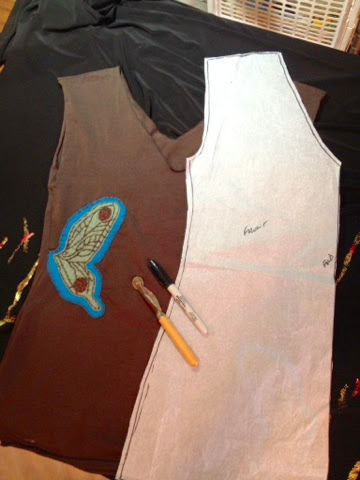 Then it occurred to me my mom would not want me to waste my abilities and my sewing passion. She would tell me to go put some lipstick on, and fix yourself up - you'll feel better! So here I am...without the lipstick. I realized I just missed October by a few days, so I thought I'd play catchup from there. 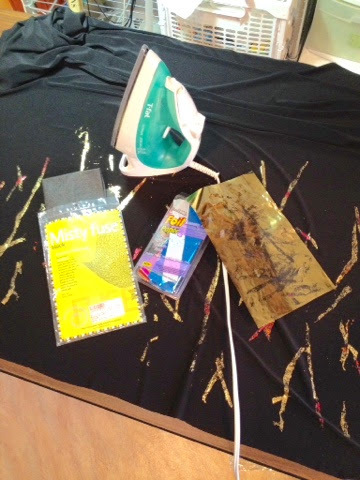 With the theme being " sew and shine" I thought I would use a foiling technique on a black knit to give it a fire opal shine, then turn it into a t- shirt. This is the t shirt I'm knocking off. More details on my blog. Bereavement is an exhausting process. Your tshirt will be lovely!